Adolf Hitler (20 April 1889 in Braunau am Inn, Austria – 30 April 1945 in Berlin) was a German politician who became the leader of Nazi Germany. Hitler also led the NSDAP (often called the Nazi Party), the democratically elected party which ruled Germany and called himself the Führer (leader) of the German Empire. The Nazis created a dictatorship called the Third Reich. In 1933, they blocked out all other political parties. This gave Hitler absolute power. Hitler ordered the invasion of Poland in 1939, and this started World War II. Because of Hitler, at least 50 million people died. During World War II, Hitler was the Commander-in-Chief of the German forces and made all the important decisions. This was part of the so-called Führerprinzip. He shot himself in 1945, as the Soviet Army got to Berlin, because he did not want to be captured alive by the Soviet Union. Nazi forces committed many war crimes during the war. They were doing what Hitler told them to do. They killed their enemies or put them in concentration camps and death camps. Hitler and his men persecuted and killed Jews and other ethnic, religious, and political minorities. In what is called the Holocaust, the Nazis killed six million Jews, Roma people, homosexuals, Slavs, and many other groups of people. Hitler's family was born in Waldviertel, in Lower Austria. At the time, the name Hitler changed in this region several times between Hüttler, Hiedler, Hittler and Hitler. The name was commonly in the German-speaking area of Europe in the 19th century. The literature says that this name is descended from the Czech name Hidlar or Hidlarcek. Adolf Hitler was born on 20 April 1889, as the fourth child of six in Braunau am Inn. This is a small town near Linz in the province of Upper Austria. It is close to the German border, in what was then Austria-Hungary. His parents were Klara Pölzl and Alois Hitler. Because of his father's job, Hitler moved from Braunau to Passau, later to Lambach and finally to Leonding. He attended several Volksschule's. Hitler's mother, Klara Pölzl, was his father's third wife and also his cousin. Hitler's father died in 1903. Hitler failed high school exams in Linz twice. In 1905, he left school. He became interested in the anti-Semitic (anti-Jewish), Pan-German teachings of Professor Leopold Poetsch. In September 1907, he went to Vienna and took an entrance examination. On 1 and 2 October, he failed the second examination. Hitler went back to Linz at the end of October. In December 1907, Hitler's mother died and, because of that, he was depressed. Hitler's mother was Catholic, but Hitler hated Christianity. He also hated Jews. In 1909, Hitler again went to Vienna to study art. He tried to become a student at the Academy of Arts, but failed the first entrance examination. Hitler said he first became an anti-Semite in Vienna. This town had a large Jewish community. In 1913, Hitler was 24 years old. At that time, all young Austrian men had to join the army. Hitler did not like the Austrian army, so he left Austria for Germany. He lived in the German city of Munich. On 16 August 1914, Hitler joined the Bavarian army. He fought for Germany in World War I. Hitler served in Belgium and France in the 16th Bavarian Reserve Regiment. He spent nearly the whole time on the Western Front. He was a runner, one of the most dangerous jobs on the Front. That means he ran from one position to another one to carry messages. 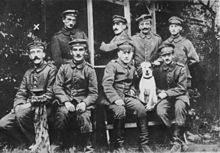 On 1 November 1914, Hitler became a Gefreiter (which was like being a private first class in the United States Army, or a lance corporal in the British Army). The government awarded him the Iron Cross Second Class on 2 December 1914. On 5 October 1916, Hitler was hurt by a bullet shell. Between 9 October and 1 December, he was in the military hospital Belitz. In March 1917, he went back to the front. There, he fought in a battle and was awarded with the Militärverdienstkreuz Third Class with swords. In March 1918, Hitler participated in the Spring Offensive. On 4 August 1918, Hitler was awarded with the Iron Cross First Class by the Jewish Hugo Gutmann. After Germany surrendered, Hitler was shocked, because the German army still held enemy area in November 1918. After World War I, Hitler stayed in the army and returned to Munich. There he attended the funeral march of the Bavarian prime minister Kurt Eisner, who had been killed. In 1919, he participated in a training programme for propaganda speakers from 5 to 12 June and 26 June to 5 July. Later that year, Hitler joined a small political party called the German Workers Party. He became member number 555. He soon won the support of the party's members. Two years later, he became the party's leader. He renamed the party the National Socialist German Workers Party. It became known as the Nazi Party. In 1923, Hitler got together several hundred other members of the Nazi Party and tried to take over the Weimar Republic government (1918–34) in the Beer Hall Putsch. The coup failed. The government killed 13 of his men (the 13 dead men were later declared saints in Nazi ideology). They also put Hitler in the Landsberg Prison. They said that he would stay in prison for five years, but they let him leave after nine months. While Hitler was in prison, he wrote a book with the help of his close friend Rudolf Hess. At first, Hitler wanted to call the book Four and a Half Years of Struggle against Lies, Stupidity and Cowardice. In the end, he called the book "Mein Kampf" ("My Struggle"). His idea of life as a battle: He got this idea from Social Darwinism, which was influenced by the English evolutionary biologist Charles Darwin. His idea that the "Aryan race" was better than everybody else: This came from Arthur de Gobineau's book called The Inequality of the Human Races. His plans for an Empire in the East: These plans came from the way Germany had captured farming land in the First World War. The idea that Judaism and communism were connected: He got this idea from the Nazi writer Alfred Rosenberg. Hitler may also have been influenced by Martin Luther's On the Jews and their Lies. In Mein Kampf, Hitler says Martin Luther was "a great warrior, a true statesman and a great reformer." In 1933, Hitler was elected into the German government. He ended freedom of speech, and put his enemies in jail or killed them. He did not allow any other political party except the Nazi party. Hitler and his propaganda minister, Joseph Goebbels, spread extreme nationalism within Germany. All media had to praise the Nazis. Also, more people were born because Hitler wanted more people of the "master race" (those he called "Aryans"). He made Germany a totalitarian Nazi state. Despite Poland being carved out of former German territory, Hitler is credited with started World War II by ordering the German Army to invade Poland. His army took over Poland and most of Europe, including France and a large part of the Soviet Union. During the war, Hitler ordered the Nazis to kill many people, including women and children. The Nazis killed around six million Jews in the Holocaust. Other people that the Nazis killed were Roma (Gypsies), homosexuals, Slavs such as Russians and Poles, and his political opponents. Finally, some of the other countries in the world worked together to defeat Germany. Hitler lost all of the land that he had taken, and millions of Germans were killed in the war. At the end of World War II, Hitler gave all people in the Führerbunker the permission to leave it. Many people did and moved to the region of Berchtesgaden. They used planes and truck convoys. Hitler, the Goebbels family, Martin Bormann, Eva Braun and some other staff remained in the bunker. Hitler got married to Eva Braun on 29 April 1945. Less than 24 hours after Hitler and Eva Braun got married in Berlin, both of them used poison to kill themselves, then Hitler shot himself in the head with his gun. Before this, Hitler ordered that their bodies be burned. This prevented him from being captured alive by soldiers of the Red Army, who were closing in on him. ↑ " "Hitler ersucht um Entlassung aus der österreichischen Staatsangehörigkeit 7 April 1925 (in German). Translation: 'Hitler's official application to end his Austrian citizenship'. NS-Archiv" (in German). Jürgen Langowski. Retrieved 2009-04-18. ↑ Both, Owen (1999). Der Zweite Weltkrieg (in German). Kaiser. p. 7. ISBN 978-3-7043-6046-5. ↑ This applies mainly to the SS: the Schutzstaffel, which was the Nazi security and military organisation. The regular army, known as the Wehrmacht, was a separate organisation. ↑ Jetzinger, Franz (1956). Hitlers Jugend (in German). Europa-Verlag. pp. 11&nbsp, f.
↑ Fest, Joachim (1999). Hitler. Eine Biographie. 2. edition (in German). Ullstein. p. 43. ↑ Bullock, Alan (1962). Hitler: A Study in Tyranny. Penguin Books. ISBN 978-0-14-013564-0. ↑ Ian Kershaw (1998). Hitler 1889–1936. DVA. p. 37. ↑ 11.0 11.1 11.2 Toland, John (1977). Adolf Hitler; Biography 1889-1945 (in German). Lübbe Verlag. ISBN 978-3-8289-0540-5. ↑ 13.0 13.1 Hitler, Adolf. Mein Kampf. Mariner Books. ISBN 978-0-395-92503-4. ↑ Bullock, Allan (1962). Hitler: A Study in Tyranny. Penguin Books. ISBN 978-0-14-013564-0. ↑ Hitler, Adolf. Mein Kampf. Mariner Books. pp. 50–51. ISBN 978-0-395-92503-4. ↑ Bullock, Allan (1962). Hitler: A Study in Tyranny. Penguin Books. p. 60. ISBN 978-0-14-013564-0. ↑ "Picture with Adolf Hitler during the march" (in German). Bibliothek der Bayerischen Staatsbibliothek. Retrieved 2009-04-24. ↑ Toland, John (1977). Adolf Hitler; Biography 1889-1945 (in German). Lübbe Verlag. p. 131. ISBN 978-3-8289-0540-5. ↑ 19.0 19.1 "Biography and facts about Adolf Hitler". Retrieved 10 July 2009. ↑ "The Beer Hall Putsch". Chris Trueman. Retrieved 10 July 2009. ↑ "Spartacus schoolnet - Mein Kampf". John Simkin. Retrieved 10 July 2009. ↑ "Nazi Fascism and the Modern Totalitarian State". Gary Grobman. Retrieved 13 July 2009. ↑ "The start of World War Two". Steven Schoenherr. Retrieved 2009-07-15. ↑ "Teachers guide - about the Holocaust". University of South Florida. Retrieved 2009-07-15. ↑ 26.0 26.1 "Historyplace - The death of Hitler". The History Place. Retrieved 2009-07-15. Alan Bullock (1991). Hitler and Stalin: Parallel Lives. HarperCollins. ISBN 978-0-679-72994-5. Alan Bullock. Hitler: A Study in Tyranny. ISBN 978-0-06-092020-3. Michael FitzGerald (2006). Adolf Hitler: A Portrait. Spellmount. ISBN 978-1-86227-322-1. Joachim Fest (2002). Hitler. Harvest Books. ISBN 978-0-15-602754-0. Ian Kershaw (1999). Hitler 1889-1936: Hubris. W W Norton. ISBN 978-0-393-32035-0. Lothar Machtan (2001). The Hidden Hitler. Basic Books. ISBN 978-0-465-04308-8. This page was last changed on 18 April 2019, at 15:01.